The Rossettis were one of the most remarkable and talented families in Victorian Britain. Of the two parents and three siblings, Dante Gabriel (1828-82) and Christina (1830-94) stood out, but throughout their lives they remained a tightly-knit unit. William Michael (1829-1919), who published this two-volume work in 1895, was the family record keeper and in the memoir of his brother we have an unmatched account of the family dynamic. He was not always candid about his brother's affairs but his biography is unparalleled for its fresh directness. Unlike all subsequent biographers, William wrote from the inside, and even if he was unable to tell the whole story, the intimate details of the day-to-day life of the great painter and poet have about them the ring of truth and authenticity. Volume 1 contains William's sympathetic memoir, while Volume 2 contains hundreds of Dante's letters to his family. Volume 1: Preface; Memoir; 1. Birth; 2. Parentage; 3. Relatives; 4. Childhood; 5. Acquaintances in childhood; 6. Childish book-reading and scribbling; 7. School; 8. Home-life during school; 9. Study for the painting profession; 10. Student-life; 11. Friends towards 1847; 12. Madox Brown, Holman Hunt, Millais; 13. The Praeraphaelite Brotherhood; 14. First exhibited picture, 1849; 15. The Germ; 16. Paintings and writings, 1849-53; 17. Miss Siddal; 18. John Ruskin; 19. Work in 1854-5-6; 20. Oxford men and work; 21. Work in 1858-9; 22. marriage; 23. Married life; 24. Work in 1860-1; 25. Death of Mrs Dante Rossetti; 26. Settling in Cheyne Walk; 27. Work from 1862 to 1868; 28. Incidents, 1862 to 1868; 29. Beginnings of ill-health; 30. Preparations for publishing poems; 31. Art-work from 1869 to summer 1872; 32. The poems, 1870; 33. The fleshly school of poetry; 34. Hypochondria and illness; 35. Stay and work at Kelmscott, 1872-4; 36. London and elsewhere, 1874-8; 37. Incidents and transactions, 1874-81; 38. Paintings and poems; 39. Dante's dream; 40. Cumberland and London; 41. Birchington-on-Sea; 42. Death and funeral; 43. Personal details; 44. 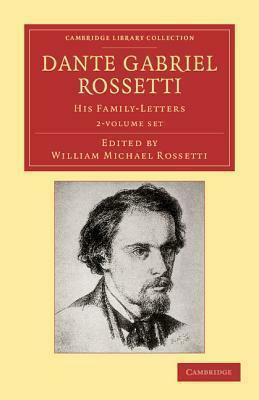 Rossetti as painter and poet. Volume 2: Letters A; Letters B; Letters C; Letters D; Letters E; Letters F; Letters G; Letters H.